This marvelous light-hearted video slot will transport you to an exciting circus performance run by a rousing master of ceremonies. The set of five reels seems to be placed inside a big striped tent, and the symbols depict all kinds of performers: acrobats, fire eaters, human cannonballs, animals and more. 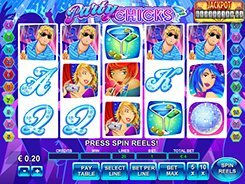 The slot is played over 20 adjustable paylines, each accepting a bet of up to $50, thus a total wager may reach an astounding $1000 per spin. The wild represented by the Tiger replaces for other icons and doubles payouts. Besides, five Tigers pay out $15,000, once landed on a payline. Amazing Circus features three different scatters that add variety and fun to the gameplay. One of the scatters, the Big Top, does not trigger any bonus feature but produces a payout of up to $10,000 if two to five of them land in any spot. 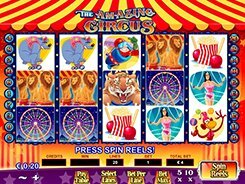 The second scatter (Ferris Wheel) unlocks up to 20 free spins, whereas another scatter (Trained Lions) activates a second-screen Circus Bonus. In the Circus Bonus, you are to pick lions that would reveal instant cash prizes, and keep picking them until you hit the Collect word. PLAY FOR REAL MONEY!